Light pink, check! Reclaimed wood, check! Greenery, check! I added this macrame Boho layer at the last minute and loved how it added some beautiful texture. Close-up of her sweet, peaceful face! 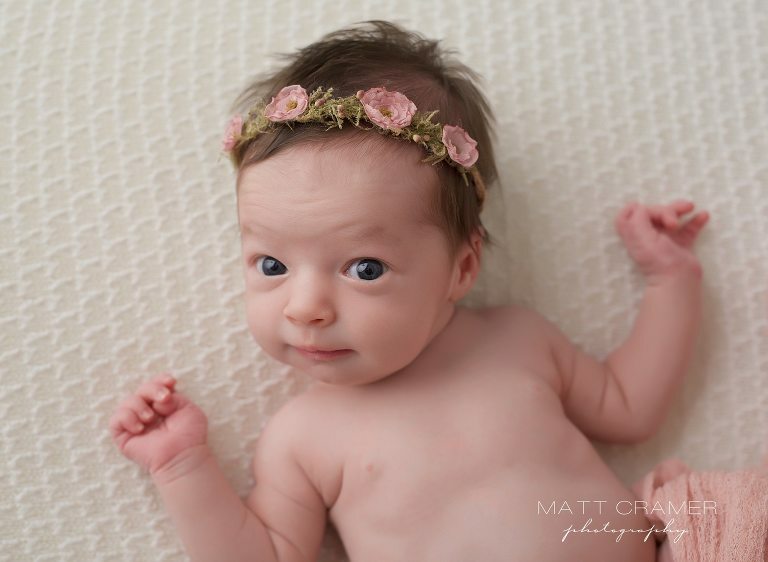 This delicate floral headband adds such a beautiful touch. 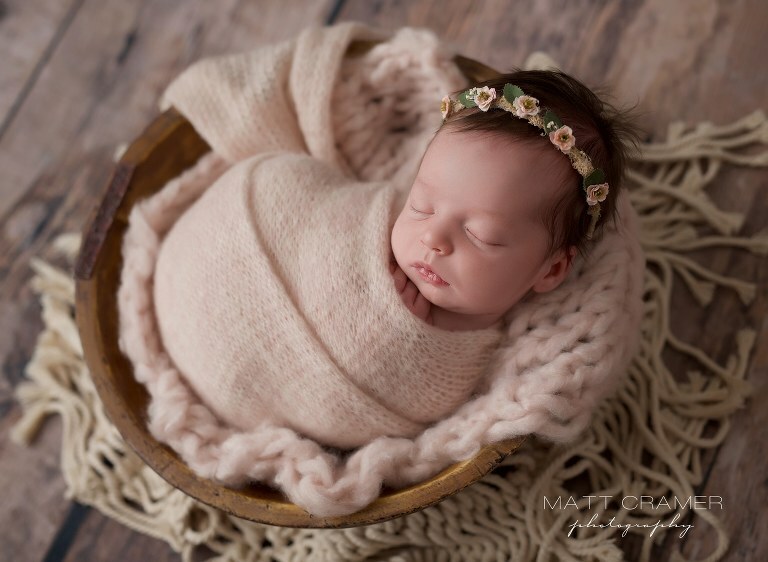 She is wrapped up and posed on our newest cashmere swaddle and blanket set. So so soft to the touch! Simple, classic bare baby shots here. This lace inspired textured fabric is a studio favorite! We caught a little smile too! These shots are often a little challenging to achieve. A lot of patience and a very, very sleepy baby are required! Sometimes baby will wake while being posed. If so, and baby is content, we try and capture some awake baby shots. Like this! Awake baby, hello! We always tell parents at the start of each shoot. This is a baby led session. We always plan for the poses you like or the props you want. But in the end, if there is a pose or a prop or a swaddle that baby doesn’t like, we move on. And if they are awake, then we shoot awake shots, too. Another set up created from the nursery vision but in a completely different look. Warms my artistic heart to no end. Light pink, natural elements, and off white, check! Those sweet toes peeking out, too. A vertical shot of just baby’s sweet face. This needs to be on a wall, in a big way, for sure! Next up, we switched to this adorable teddy bear swaddle! Specifically requested by mommy. Doesn’t she look so snuggly? Details! Don’t forget your details! Having these little features captured will bring mommy so much joy when her baby girl is going off to Kindergarten one day! I’ll openly admit I got teary eyed when I saw this shot. It speaks to me in ways that are hard to explain. Maybe it’s the strength of daddy’s hands surrounding her so perfectly? Or maybe it’s the swaddle design that has grown to be my signature swaddle? 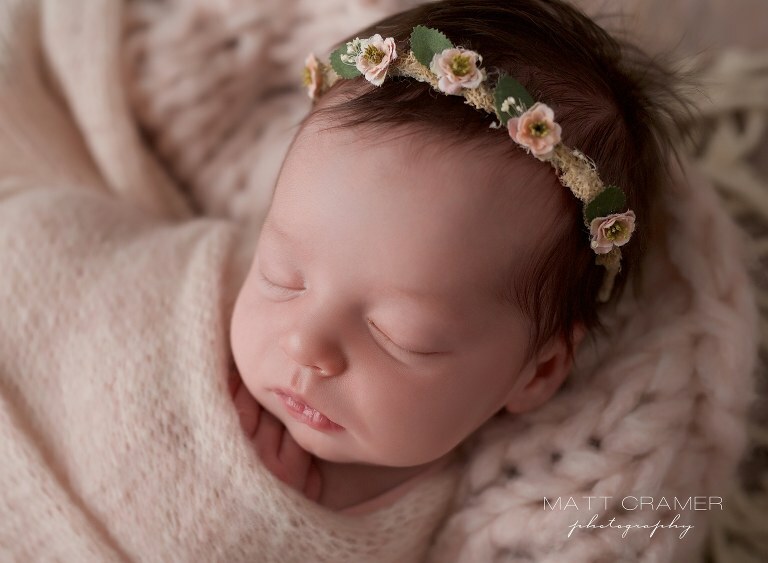 Or the way her delicate floral cream headband ties back so perfectly to the swaddle fabric? I’m not sure, but it is my absolute favorite from the session! At the end of the session, we finished up with parent shots. First up was mommy with her sweet baby girl. The two of them in cream against a neutral background. These images will last the test of time as classic and timeless. Beautiful family of three! Look at those smiles. Love them! I’m just going to leave this right here for ya. 🙂 One gorgeous mommy with her equally gorgeous baby girl!